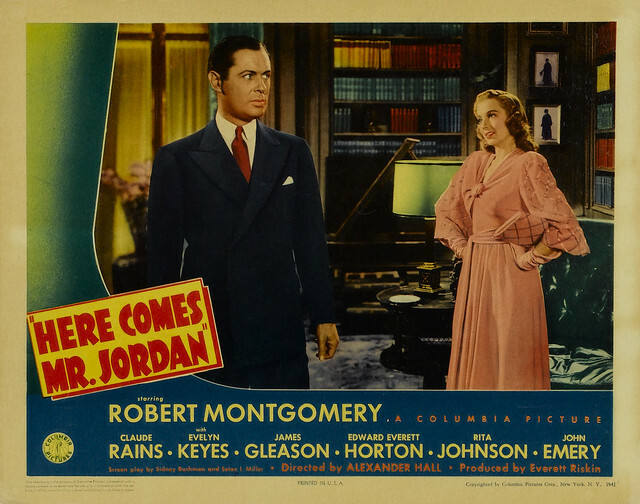 TCM will air Here Comes Mr. Jordan (1941) at 8 pm June 20 as part of The Essentials series. This delightful movie features Robert Montgomery (above) as a boxer who returns from the grave. I'll outline five things to look for in this classic comedy. Here Comes Mr. Jordan (1941) is old Hollywood at its very best. This comedy about the afterlife features a stellar cast in a movie filled with crackling dialogue and plenty of laughs that breezes by at an entertaining 98 minutes. Here Comes Mr. Jordan tells the story of boxer Joe Pendleton (Robert Montgomery) who is mistakenly killed in an airplane crash and brought to Heaven by a befuddled angel (Edward Everett Horton). Divine messenger Mr. Jordan (Claude Rains) must sort things out by giving Joe a new earthly body so he can fulfill his destiny. A vintage poster for Here Comes Mr. Jordan (1941). Premise: Movies about the afterlife were quite popular in the 1930s: There's Fredric March as a suave Grim Reaper in Death Takes a Holiday (1934), Lionel Barrymore battling the Angel of Death in On Borrowed Time (1939), and the glamorous ghosts in the Topper films. Here Comes Mr. Jordan, based on an un-produced play by Harry Segall, puts a different twist on the genre. Joe doesn't come back as a spirit; instead he inhabits different bodies, which creates a screwball set-up that has a touching pay-off in the final scene. Here Comes Mr. Jordan inspired several movies in the 1940s and 1940s, including I Married an Angel (1942) and Angels in the Outfield (1951), but its most obvious influence is on It's a Wonderful Life (1946), which includes an angel (Henry Travers) who allows George Bailey (James Stewart) to see what Bedford Falls would be like if he'd never been born. Montgomery: Montogomery, who was a popular romantic leading man at MGM, wasn't thrilled about making Here Comes Mr. Jordan, mostly because it was shot a Columbia Pictures, which was then considered a "poverty row" studio. Even so, Montgomery gives one of his best performances as Joe, a New Jersey palooka with a heart of gold. Montgomery was nominated for a Best Actor Oscar and although his fellow nominees included Orson Welles for Citizen Kane, I believe that he should have taken home the trophy (Gary Cooper won for Sergeant York). Joe inhabits three different bodies during the course of the film, and Montgomery subtly changes his performance each time without the aid of makeup or special effects. Supporting cast: Here Comes Mr. Jordan features the best line-up of old Hollywood character actors this side of Casablanca (1942). There's Horton, a veteran of many Fred Astaire-Ginger Rogers musicals, as the angel of death for New Jersey (he wants a transfer to a more sophisticated locale), and Evelyn Keyes gives a touching performance as Joe's love interest (TCM is airing Here Comes Mr. Jordan as part of a marathon of her films). However, the two standout performers are Claude Rains as Mr. Jordan and James Gleason as Joe's manager. Rains is perfection in a tricky part that requires him to be an unseen presence in most scenes while also being the guiding force behind all the action (in many ways, it's a very similar to the stage manager part in Our Town as you can see in the clip below). Gleason earned an Oscar nomination for his role as a boxing manager who can't believe that his best fighter has returned from the grave. In the pink: Joe frequently uses the slang term "in the pink" throughout Here Comes Mr. Jordan. The phrase means in perfect physical condition in boxing parlance. It was first used in 17th-century England when rosy pink cheeks were considered a sign of good health. Remakes: Here Comes Mr. Jordan was a huge hit that earned seven Academy Award nominations. It inspired a 1947 sequel, Down to Earth, and two remakes. Warren Beatty took on the role of Joe Pendleton in Heaven Can Wait (1978), although this time around Joe is a football player with Julie Christie as his love interest. Here Comes Mr. Jordan was remade a second time as Down to Earth (2001) with Chris Rock as a failed comedian. If you missed TCM's airing of Here Comes Mr. Jordan, it's available on DVD and video on demand.